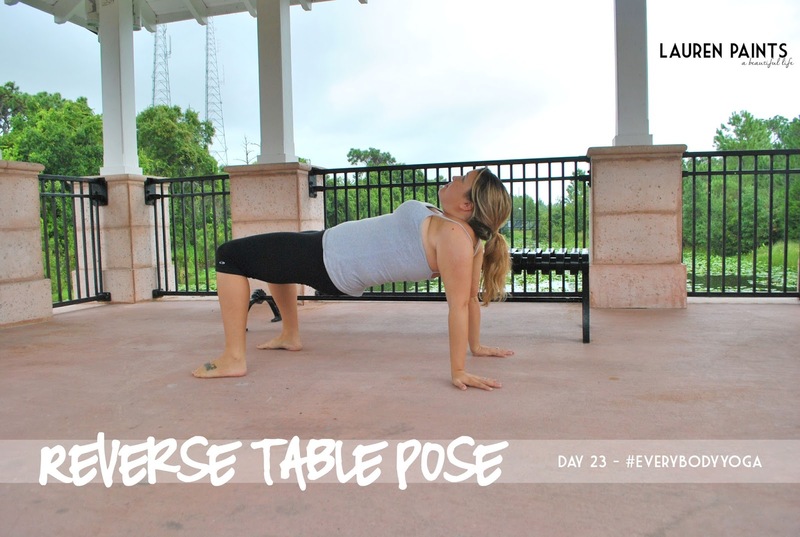 Reverse Table provides a deep stretch to your entire upper body, including your shoulders, chest, abdomen, and spine. This pose will also help build strength throughout all the core muscles and the muscles surrounding the spine, which improves balance and posture! Additionally, Reverse Table Pose helps strengthen your wrists, arms, buttocks, legs, and back. Opening up the entire front side of the body is invigorating and energizing, which provides relief from fatigue and stress - the perfect way to fight the mid-week blues. This pose is probably something you remember from elementary school as the "crab" pose. Start by bending your knees, place the soles of your feet hips width apart on the ground, heels aligned with hips. Press down into your hands and feet. Lift your hips up with your shoulders and hamstrings. Do your best to align your knees and shoulders in a line.